We cannot believe that 2017 is coming to an end! Are you and your pets ready to welcome the New Year? New Year’s festivities can be a time of stress for many dogs and cats, as well as their families. Whether you are celebrating at home with guests or having a night out on the town, here are some tips to help keep your Furry family members safe and calm. Many pets will try to escape when they are scared, please keep your pets indoors in a safe and quiet location. If guests are coming over, make sure that they watch the door when coming in and out of your home so that pets do not get out in the excitement. Make sure that your pet’s ID tag and microchip information is up to date with your current contact information. This will help just in case your pet should get escape during all of the festivities. 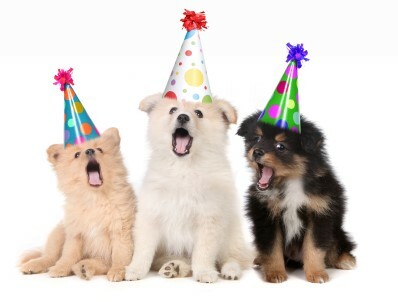 Loud noises and celebratory commotion can cause even the calmest to experience pet anxiety. Playing some calming white noise or soft music will help with the unpredictable, loud noises and explosions caused by fireworks. Light flashes and the flickering of fireworks can also escalate your pet’s anxiety. Closing blinds and curtains, as well as turning indoor lights and/or television on can help minimize the distraction. Giving your pet plenty of exercise and attention on New Year’s Eve day will help them to rest more peacefully that night. If your pet has a special place for a good nap like their crate, behind the sofa, or under a comfy blanket, make sure that they have access to their happy place. Contact us for specific recommendations if your pet suffers from severe anxiety or if you have further questions. In some cases, a compression garment, pheromones, or even a medication may be a good course of action. Thank you for all of your support in 2017! This has been an incredible year for us and we hope that it has been for you and your family too. We would like to wish you a happy and healthy New Year and look forward to seeing you and your Fur Babies in 2018! !